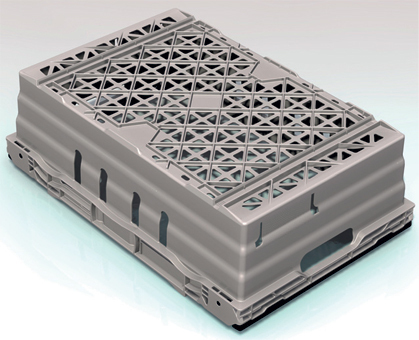 Plastic returnable transit packaging specialist, LINPAC Allibert, has designed a new version of its Maxinest grocery retail tray to meet growing demand for equipment that works seamlessly with the latest automated filling, weighing and handling technology. The Maxinest+ is the most advanced in the Maxinest range, which now features 20 variations. A recess under the bale arms allows access by robotic stack/nest systems, while the reinforced base has been designed for quiet, smooth operation on all conveyor types and to meet the close tolerances demanded by robot pick and place systems. Maxinest+ has been proven to reduce noise levels by at least 12.5% on roller conveyors, depending on type and configuration of the conveyor. Other features include smooth surfaces to protect contents and promote hygiene, and the ability to stack 10 high on bale arms or nest up to 77% of its original height with the bale arms pushed back.